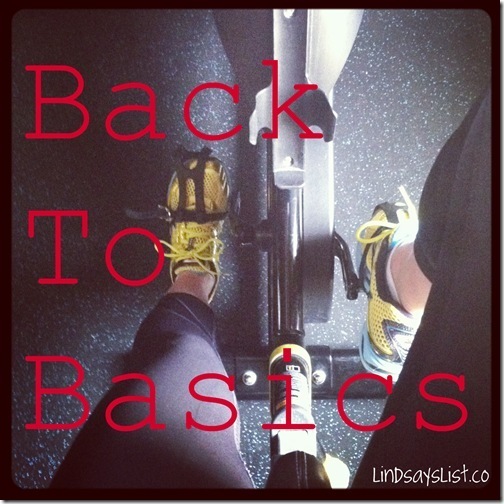 Back To Basics - Why You Should Be Lifting Weights! Back To Basics - Why You Should Be Lifting Weights! 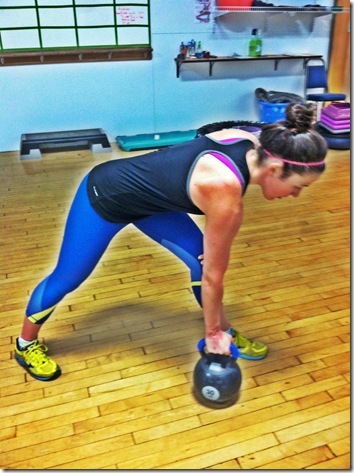 back to basics: why SHOULD i lift weights? Quick question: Do you lift weights? Even though the benefits should outweigh any negatives, the fact of the matter remains that most women opt for the treadmill or elliptical over the weight room, thinking that they’ll burn more calories. Nothing could be farther from the truth! While it is true that you might burn more calories DURING a cardio workout, strength training trumps cardio for it’s EXCESS POST OXYGEN CONSUMPTION, or “EPOC.” Simply put, your body uses energy (aka calories) to repair itself after a strength training session. Therefore, the “afterburn effect” that accompanies strength training means that your metabolism will be stoked for 24-48 hours AFTER a session. Pretty cool, right!? Another myth that prevents women from truly embracing weight lifting is the old adage – “I’ll look like a man.” Erroneous. Unless you’re supplementing your diet with massive amounts of testosterone or creatine, the female body simply cannot put on as much muscle as a man. In fact, if you lift weights regularly, you’ll not only trim your waistline and tone up, but you can actually ADD curves to your buttocks and chest by adding more muscle fiber to those areas. As if all of this wasn’t enough enough to motivate you into the weight room, strength training also aids in the prevention of osteoporosis and arthritis: two diseases that primarily affect women. By performing weight bearing exercises, a woman can actually increase her bone density! This helps prevent any future fractures and breaks. It’s best to be proactive about the prevention of osteoporosis and arthritis by starting these exercises NOW in a woman’s 25-50-year old range. 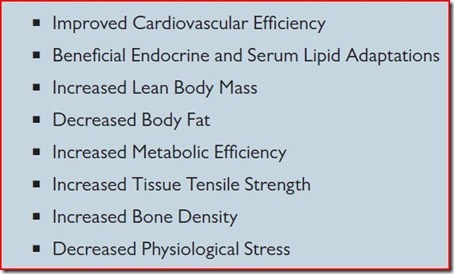 Now that we know that WHY’S of strength training, what’s stopping us from beginning a weight lifting program??? Honestly, it can be intimidating to go into the weight room for the first time. You might not know what to do, how often to do it and in what order. Answer? Seek out information! There are so many resources for Program Design, Proper Form, and Goal Setting! All you have to do is ASK. Sign up for a few sessions with a trainer at your gym, read other healthy living blogs from knowledgeable people that can provide you with information, and/or check out some weightlifting books at your local library. Having your own basic knowledge in this area can only benefit you. What often happens is that people start lifting, they seek out information, and then they invariably seek their own certification. In the next “Back To Basics”, I’ll give you some tips on CREATING YOUR OWN LIFTING ROUTINE! Please don’t wait on that post before setting foot into the weight room! Start today – MOVE TODAY! QUESTION: Do you lift weights? Lift heavy? P.S. Almost forgot to announce the Swanson Vitamins giveaway winner! Drumroll…..the winner is #96- Brittany @ Delights and Delectables! 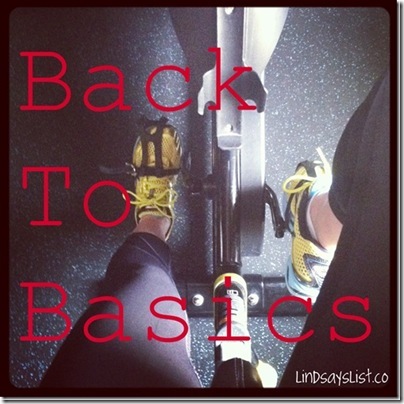 This entry was posted in Back To Basics, Blog, Blogging, Workout. Bookmark the permalink. added your RSS feeds, so when I have time I will be back to read much more, Please do keep up the fantastic work. I love lifting heavy, which for me is not as much as I thought. I’m working on it though, and I love seeing all the muscles and the energy I have. When I did tons of cardio, I was always tired. I saw the link for this on Lindsay’s blog and I love it! I used to have no interest in weight lifting and then when I did get interested I was intimidated. Meeting up with a trainer, online videos and blogs have been so helpful in learning what to do and how to feel comfortable in the weight room. Defs! Lift heavy woo. I’ve done it for a while now and soon I’ll be doing a proper training program thanks to an awesome blogger- Tara @ Sweat Like a Pig. YES! Weights are a must!!! Great read Lindsay! You know I’m a lifting fan! I so wish we were seeing each other to lead another boot camp workout in a few weeks. :( Still HATE I won’t be at Blend and miss you so stinking much! I’m in love with the weights right now as I’m enjoying a break from my norm. I always have strength training in my overall plan, but I’ve never given it center stage. It’s a fun change! I got into heavy lifting in college, when my boyfriend (now husband) would teach me how to lift in the boy-filled weight room (I just wanted to spend more time with him, so I went for it). I definitely prefer it to running and have never been more proud when I got three pull ups in a row once. That begin said, I don’t belong to a gym right now and am building up my at home equipment (it’s not much – at all). I do a lot of bodyweight “lifting”, such as pushups, squats, lunges, etc. Will bodyweight workouts give you the same benefits of heavy lifting? Is this something you’ll cover in the next post? Yes I lift!!! It has changed my life…. literally. I used to be a cardio queen, and now I would much rather lift. Yay for the giveaway! emailing you now friend! YES to lifting & YES to lifting heavy at times! 3 years ago I would’ve had a totally different answer, now I love it! I’m sharing this post on Twitter, great info! I do lift weights, and over the past year, I’ve started lifting a bit heavier. For a long time, I would just do the same exercises with the same amount of weight all the time. Now I’m working on varying the types of moves, along with challenging myself with different amounts of weights (as well as types–medicine balls, dumbells, plates, resistance bands . . . ). So far, I’m liking the results. I feel stronger and think I have better muscle balance overall. Great post! I’m trying to add more weights into my running and biking workouts. Another idea: What the heck do I do with my stability ball? I need fun exercises. The poor guy sits in the corner all sad and unused. I do lift weights and love the muscle exhaustion when it’s all done! 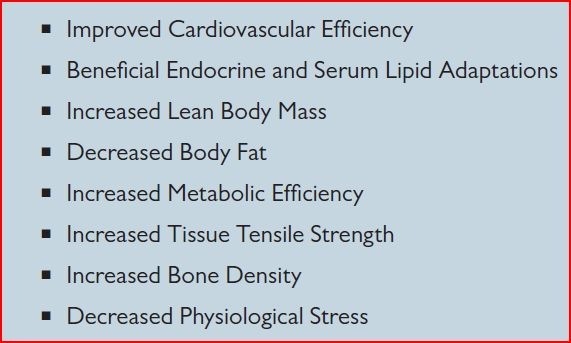 And I am now researching nutrition info to support building muscle and burning body fat. Do you have any advice? Good post! Lifting is crucial. But of course! Love weight, hate cardio, so the decision is always easy for me! I used to lift–I went through a round of Starting Strength, but then I got bored because I never really felt like I had a consistent goal to reach. Ever since I started half-marathon training, the only strength training I’ve been doing are in the form of Pilates and yoga. I think I’m going to try to incorporate more circuit-style weight-lifting into my routine, because those seem to keep my attention longer than “normal” weight-lifting routines! You KNOW I love this!!! One of the best things I thought Jillian Michaels said last night at the show was that it is important to have abalance of cardio AND strength. Now that I’m no longer working out in a gym, I do more body weight training than actual weights but you are so right-strength training makes me feel wonderful! I recently got back into weight training. I was doing bootcamp style work with just my body weight but I never saw much improvement. I found a weight training routine on bodybuilding.com. I supplement it with my running & tri training and so far I’ve noticed a lot of changes after only a month. I lift 4 days a week, each day a different workout targeting different muscles. I’m always excited when I get to add on more weights and push myself. When I was in the midst of my ED and was at my thinnest, I look back and see I was “skinny fat”- running the the treadmill 2 hours of day and not eating right shed pounds, sure but it was NOT healthy. Now, I’m incorporating strength training into my routine and I like seeing improvements in how much I can lift, ect. Great post. I’ve always incorporated weights into my workout regimen, but I’ve just recently started *really* using them… i.e. lifting. I was intimidated by the weight room at first, but now I’m loving it! I can’t wait to get better and stronger. I’ll be sharing this post all over the place today! EMPHATIC YES!!! I recently started lifting, and it helps sooo much to go with a friend – makes the gym seem less intimidating. I’m currently only going once per week, but this post has inspired me to up that to at least twice, thrice if it can fit in my schedule. Thanks!! YES!! sharing this with all the females i know who think otherwise!! nothing I love more than my iron. Over the past couple of years I’ve finally pushed myself to actually lift heavier weights (not just 5-10s!!!). I love the way it makes me feel and the definition I get from lifting! I love lifting weights! Nothing is better than feeling strong!